At work in the corporate world most of us use Outlook to manage our calendar and tasks. The thing is that filling out each new task and setting up reminders for them becomes really repetitive really quickly. If you find yourself creating a lot of tasks that require reminders, this groovy guide can shave some time off of the creation process. By default, the Reminder box is not checked when creating a Task in Outlook 2010, also in both the date and time boxes you will see a greyed out “None” rather than a time. We’re going to fix that and assign a default time. 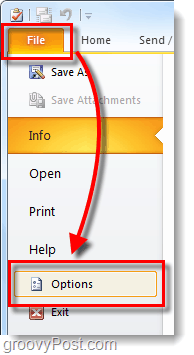 In Outlook 2010, Click the File ribbon and Select Options. Click the Tasks tab and Check the box labeled Set reminders on tasks with due dates. While you are here you can also change the default reminder time that will show up when creating tasks. By default it is set to 8:00 AM. 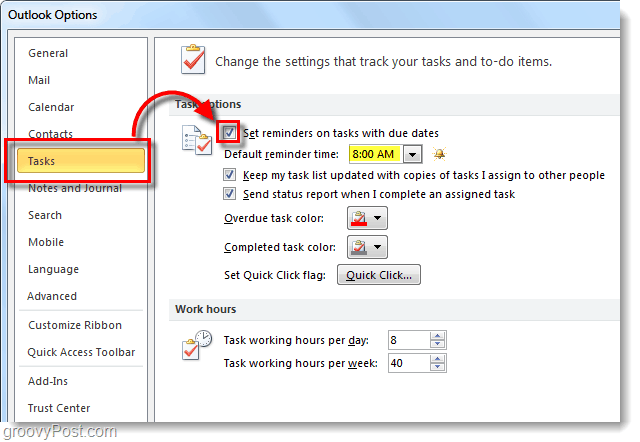 Now when you create Tasks in Outlook 2010 the Reminder will automatically be checked and set for the default time from Step 2. This will help you remember to set reminders for your tasks, but it can also just be useful as a daily reminder if you set it for the time that your work day usually starts. Even though I have the setting selected, and the default time at 6:00am, when I create a new task, there are not reminders automatically set… this is whether I use the quick task adder bar or the dedicated “New Task” button. Any ideas? I know this feature and use it for my outlook tasks. But what I can’t seem to find is how to get this for outlook tasks that I create from within OneNote 2010. I am assigning tasks for collections to various people in the office. However, when I assign the task with a reminder they get the assignment right away but it does not put the reminder on for them they have to open the task and add the reminder. Is there anyway that Outlook will give them the reminder as well at a later date that I choose? Would love any help someone can give me. My default reminder time for Tasks is 9:00 A.M. but when my reminder window pops up it reads that the tasks are due at 5:00 P.M. even tough they are set for 9:00 A.M. in which is 8 hours later. I checked my time zones and they are correctly set for Eastern Time U.S. and Canada. The task is set to be due by a certain date, so it assumes that it must be done by the end of that day (5pm). However the reminder can be set for amy time (9am in your case). From what I can see you can’t set a specific time for the task to be done. When I create a new Task in Outlook 2015, the Due Date is set to “No Date.” I would like it to default to Today for all new Tasks I enter using CTRL – n.
It would be a huge time saver for me.